Evolution is the unifying principle in biology. It explains the overwhelming diversity of life on Earth, as well as the constancy of molecular and morphological attributes observed in diverse assemblages of plants and animals. Charles Darwin's publication of On the Origin of Species by Means of Natural Selection in 1859 marks the beginning of scientific understanding of how evolution has molded the history of life. Darwin, along with his contemporary Alfred Russel Wallace, provided convincing and abundant evidence that all organisms, living and fossil, have descended with modification from a common ancestor and that the chief agent of modification is natural selection . Shortly after the publication of The Origin of Species, nearly all biologists accepted the premise that organisms have changed over time. However, the exact mechanisms of natural selection and the rates at which evolutionary changes occur are still subject to scientific discussion. Evidence for evolution comes in many forms, with some of the strongest derived from observations of living animals. First, there is the striking similarity among vertebrate embryos. Despite great variation in adult forms, early stages of embryonic development are virtually indistinguishable: the human embryo is not easily distinguished from the embryo of a fish or an elephant. This embryological similarity is consistent with a common ancestry among all vertebrates. Second, there is the phenomenon of homology. Structures in two or more species are termed homologous if they can be traced back to a common origin. Clues to homology usually lie in the skeletal structure and its connections to surrounding parts, rather than to a similar function. 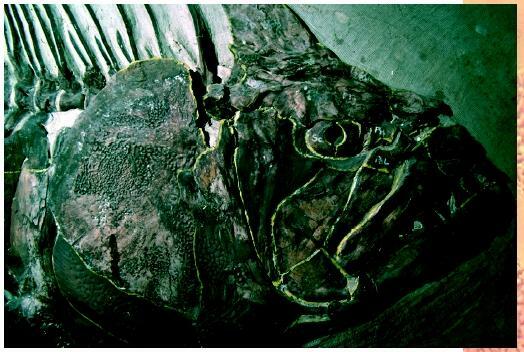 Fossil of a fish, Xiphactinus (Portheus) molossus . Evolution cannot be understood without studying the fossil record. and ulna, which are in turn connected to the bones of the hand. So, even though organs and bones may look drastically different and may serve very different functions, the fact that they can be identified as the same organ with modification supports evolution. Finally, vestigial organs provide an indication of biological modification and change, in that they remain even when their original function is lost. For instance, whales are now fully marine organisms, but they evolved from terrestrial carnivores tens of millions of years ago. Whales retain remnants of pelvic elements situated near their "hips" that no longer have any clear function in hindlimb activity. Additional evidence for evolution comes from the study of living populations. Some scientists take a macroscopic approach by documenting morphological and behavioral changes in natural laboratories. A good example of this type of work can be found in Jonathan Weiner's The Beak of the Finch (1994). In this account of evolution in action, scientists visit island populations where they measure morphological attributes of animals and plants (for example, the beak size of finches in the Galapagos) and correlate those changes to environmental changes. They can follow the breeding patterns of populations over many generations and record changes that are passed along, thus developing an hypothesis of adaptation and natural selection. On a molecular level, some of the strongest support for evolution lies in the deoxyribonucleic acid (DNA) of organisms. New techniques allow scientists to extract and replicate DNA sequences that can then be compared to sequences from other animals. Because DNA ultimately controls both morphological and behavioral features in organisms, similarities and differences among DNA sequences can clearly reveal the path of evolution. The distribution, morphology , and genetics of living populations all provide evidence for evolution, but the complete picture cannot be understood by the study of living populations alone. The origin of major new structures and body plans must be studied through the archive of evolution, the fossil record. In the sedimentary rocks deposited over the last several billion years of Earth's history the ancestry of living organisms can be traced, and the mysteries of species origination and extinction can be explored. The 3.5-billion-year time frame for biologic evolution provided by the rock record is great enough for even the most improbable of events, such as rare mutations, to have occurred repeatedly. This archive of evolution was calibrated with the discovery of radioactive decay and the advent of radiometric dating in the mid-twentieth century. The absolute dates that define the modern geological time scale serve to guide scientific estimates of the time necessary for new genera and species to evolve by providing rates of change. One of the main conceptual differences that continues to plague the scientific understanding of the evolutionary process is the question of evolutionary rates. Two main schools of thought have developed over the years. The traditional view is one of gradualism, with evolution proceeding slowly, through intermediate forms lost from the fossil record (missing links). There is some support for this view in the fossil record. The alternative view of evolution is termed punctuated equilibrium , and it too is supported by patterns in the fossil record. Those who promote punctuated equilibrium hold that species evolution is driven largely by chance and occurs in pulses, whereas the maintenance of a species during its longevity is driven by selection and is viewed in the fossil record as relative stasis . These ideas, both of which no doubt hold some credence, have revitalized debate extending across evolutionary topics, from the level of change within isolated populations to longer-term patterns. Most important, they have signified a general acceptance of the concept of evolution among biologists and have provided the impetus for paleontologists and biologists to probe deeper into the remaining mysteries of evolutionary pattern and process. Carroll, Robert J. Patterns and Processes of Vertebrate Evolution. Cambridge, MA: Cambridge University Press, 1997. Futuyma, Douglas J. Evolutionary Biology, 2nd ed. Sunderland, MA: Sinauer Associates, 1986. Weiner, Jonathan. The Beak of the Finch. New York: Vintage Books, 1994.